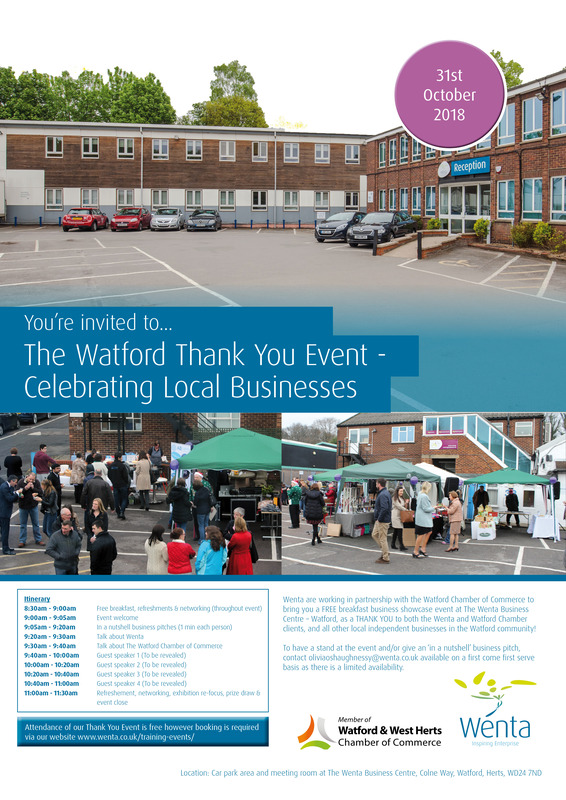 Wenta are proud to introduce the Watford Thank You Event on October 31st 2018 (8:30am- 11:30am). It’s the next chapter in Wenta’s series of events to thank our clients. It’s the first of its kind in Watford, and we are excited to announce that we are teaming up with the Watford and West Herts Chamber of Commerce, to thank the rest of the local independent Watford business community as well! The event is completely free and will feature a complimentary breakfast, networking opportunities, business pitches, a Wenta and the Watford Chamber client business showcase, plus so much more! It's our way of thanking all our loyal customers and clients. We are also excited to offer our clients four hot-topic guest speakers at the event, with the surprise speakers to be revealed shortly. The free breakfast will be provided from 8:30am and give all attendees the opportunity to network and connect with other businesses in the local area. With the promise of business stands and talks, the Thank You Event is a fantastic opportunity for the local business community, aiming to provide all attendees the chance to build new business relationships, whilst also gaining invaluable knowledge that will be extremely useful to them on their business journeys, it’s certainly an event not to be missed! If you’re looking for new workspace, business start-up advice or would like more information on Wenta visit www.wenta.co.uk or call 0845 371 0891. •	Wenta run The Hertfordshire Start-up Programme and The South East Midlands Start-up Programme, both part-funded by The European Regional Development Fund. These programmes offer residents of Hertfordshire and the South East Midlands with up to 12 hours of free business support and advice in the form of training workshops, advice online and face-to-face as well as usage of Wenta. Partners of The Hertfordshire Start-up Programme are Dacorum Borough Council and STANTA. Partners of The South East Midlands Start-up Programme are The University of Bedfordshire and The University of Northampton. •	Wenta is the largest enterprise agency in Herts and Beds and provides free start-up advice and training to those thinking of starting a business. They also own and manage a number of business centres comprising workshops and offices with a combined space of over 100,000 square feet, let on monthly licence terms to small businesses. •	Wenta run a number of programmes aimed at inspiring young people and giving them the confidence to make their ideas happen. Wenta’s education team work with local schools, colleges and universities to promote enterprise and entrepreneurship. •	Wenta work in partnership with organisations such as The Prince’s Trust to provide business advice and support to start-up, new and existing businesses across Hertfordshire and Bedfordshire. Services include: one-to-one general business advice; training and skills development courses; specialist advice including Tax, Legal and IT; and online support via our online Wenta business advice portal. •	Wenta run a series of business incubation centres located at The Business & Technology Centre in Stevenage, The Wenta Business Centre in Watford, The Enterprise Centre in Potters Bar and Hertford Regional College in Ware. These co-working hubs are designed to help entrepreneurs at their starting point offering new business owners modern hot-desking facilities, access to an on-site business advisor, access to training courses and events as well as networking opportunities with other entrepreneurs. 25-10-2018 The Watford Thank You Event Is Nearly Here – Guest Speakers Announced!